The principal and most common flavourings that characterise a Sicilian caponata are: the celery, capers, green olives and the sweet and sour, caramelised sauce made with vinegar and sugar (the agro dolce). Caponata is commonly made with eggplants (popular in Palermo) but my mother’s family’s version of caponata contains peppers (capsicums) as one of the principal ingredients. Her family come from Catania and this is a local variation in many other parts of Sicily as well. In fact, I have eaten this variation in restaurants in the following Sicilian locations : Syracuse, Catania, Sciacca, Mazara del Vallo, Agrigento, Ragusa Ibla and Caltagirone. Sicilians will keep on arguing about which is the true caponata. Some traditional recipes use tomato paste rather than chopped tomatoes. Some add garlic, others chocolate (or cocoa). Many recipes contain nuts – almonds or pine nuts or pistachio, in others herbs are added – sometimes basil, at other times oregano or mint. Certain recipes also include raisins or currants and some, fresh pears. One of my neighbours whose family also comes from Catania adds potatoes to his. It is now the perfect season for making caponata – the peppers are sweet and the eggplants have not yet developed too many seeds (this is something that happens at the end of their growing season). I always fry my vegetables separately because vegetables cook at different rates and it is far better to fry or sauté food in batches than crowd the pan. Traditionally in caponata, the celery is pre-cooked in salted, boiling water before being added to the other ingredients. However, because I like the taste of the crunchy celery I have never pre-cooked it. The legacy of my grandmother’s caponata lives on. My friends who have tasted my caponata now cook it for themselves. As I read you recipe on “caponata” I could smell the flavours ( like when my mother was making it). He is now cooking caponata for his friends and family in the US…. This version of caponata was published in the summer issue of the magazine, Italianicious (Essence of Italy, Dec 2009). The summer issue was a special edition on Sicily and I was asked to contribute. Each issue of Italianicious contains information and stories about all things Italian in Italy and in Australia. Do not feel intimidated by the long list of steps to cook it. It really is very simple. Cut the eggplant into cubes (approx 30mm) – do not peel. Place the cubes into abundant water with about 1 tablespoon of salt. Leave for about 30 minutes – this will keep the flesh white and the eggplant is said to absorb less oil if soaked previously. Prepare the capers – if they are the salted variety, ensure they have been rinsed thoroughly and then soaked for about 30 minutes before use, and then rinsed again. Cut the peppers into slices (approx 20mm) or into rectangular shapes. Slice the celery sticks and the green leaves finely. Peel, and coarsely chop the tomatoes (or use tomato paste). Heat a large frypan over medium heat with ¾ cup of the extra virgin olive oil. Add eggplant cubes and sauté until soft and golden (about 10-12 minutes). Place the drained eggplants into a large bowl and set aside (all of the vegetables will be added to this same bowl). If you want to, drain the oil from the eggplants back into the same frypan and re-use this oil to fry the next ingredients – the peppers. Add new oil (to the left-over eggplant oil) plus a little salt and sauté the peppers, until wilted and beginning to turn brown (about 10-12 minutes). Remove the peppers from the pan and drain the oil from the peppers back into the same frypan. Place the peppers in the bowl with the eggplants. Add a little more oil to the pan and sauté the celery gently for 5-7 minutes, so that it retains some of its crispness (in more traditional recipes, the celery is always boiled until soft before being sautéed). Sprinkle the celery with a little salt while it is cooking. Remove the celery from the pan and add it to the eggplants and peppers. Add the tomatoes or the tomato paste (with a little water) to the onions, and allow their juice to evaporate. Add the capers and olives. Allow these ingredients to cook gently for 1- 2 minutes. Empty the contents of the frypan into the bowl with the other cooked vegetables. Add the sugar to the frypan (already coated with the caramelised flavours from the vegetables). Heat it very gently until it begins to melt and bubble. Add the vinegar and evaporate. Incorporate the cooked vegetables into the frypan with the agro-dolce sauce. Add ground pepper, check for salt and add more if necessary. Gently toss all of the ingredients over low heat for 2-3 minutes to blend the flavours. Remove the caponata from the pan and cool before placing it into one or more containers. Store in the fridge until ready to use – it will keep well for up to one week and it improves with age. *** I first published this post In Feb 2010. 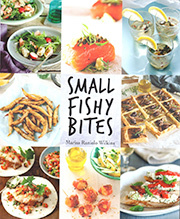 In my Book Sicilian Seafood Cooking, there is a whole chapter devoted to Caponata – made with various vegetables. 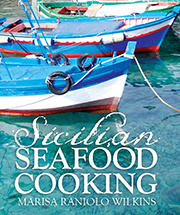 Sicilian Seafood Cooking was first published in Nov 2011 and republished in Dec 2014. ‘caponata’ for his work colleagues- a function at his workplace embracing different cuisines of our Australian multicultural home with a shared lunch. The ‘caponata’ was a big success and many of his colleagues have asked for the recipe. Everything my Mom used to cook growing up. Still haven’t mastered the scacce, still trying. The shaping of scacce takes practice…you will just have to make more of them. Lana, it gives me so much pleasure to hear this (especially that your grandmother helped you to make the caponata). Every time I have made it, my family and guests have loved it. great post. I tend to add a little more sugar to my version; but none the less YOUR version is very well. Thanks much for sharing. I just finished making this caponata–I had to improvise a bit since I had oriental-style eggplant, and grape tomatoes–but I did not improvise on the agro dolce sauce–and I’m very pleased with the result. Thanks for sharing this recipe–I particularly like the crunchy celery! I am pleased it worked. I have just returned from another trip to Sicily and I noticed that carrot was also added in several restaurants where I ate caponata – an ingredient I would not have considered. Dear Marisa my name is roberto i love cooking for my family that my daughter became a chef, your caponata recipe is what my mother made coming from catania and lived opposite the fish market, but through the years i’ve changed the recipe, having a wood oven i bake the eggplants the capsicums and garlic and onions, the rest i use the same recipe that you do . but i want to thankyou for your work and keeping the sicilian culture alive. i play the piano in melbourne and sing most forgotten sicilian songs ciao for now. Sounds like a great way to do it. Thank you.